Download the one-page Summary (PDF, 283KB) or the full report (PDF, 4.12MB). View the summary presentation. 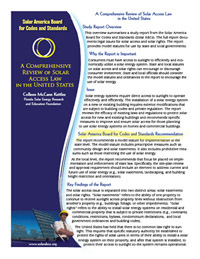 This overview summarizes a report from the Solar America Board for Codes and Standards (Solar ABCs). The full report documents legal issues for solar access and solar rights. The report provides model statutes for use by state and local governments. Consumers must have access to sunlight to efficiently and economically utilize a solar energy system. State and local statutes on solar access and solar rights can encourage or discourage consumer investment. State and local officials should consider the model statutes and ordinances in the report to encourage the use of solar energy. Solar energy systems require direct access to sunlight to operate effectively and efficiently. The installation of a solar energy system on a new or existing building requires exterior modifications that are subject to building codes and private regulation. The report reviews the efficacy of existing laws and regulations to protect solar access for new and existing buildings and recommends specific measures to improve and ensure solar access for those planning to use solar energy systems on homes and commercial buildings. The report recommends a model statute for implementation at the state level. The model statute includes prescriptive measures such as community design and solar easements. It also includes prohibitive measures such as those restricting the use of solar energy. At the local level, the report recommends that focus be placed on implementation and enforcement of state law. Specifically, the site-plan review and approval requirement should include an element to address current and future use of solar energy (e.g., solar easements, landscaping, and building height restriction and orientation).